Year after year during the holiday season, living rooms across the world are furnished with evergreen trees. For some, the tree may be a memorial and a tribute to the season, for others it may be the hallmark of tradition. 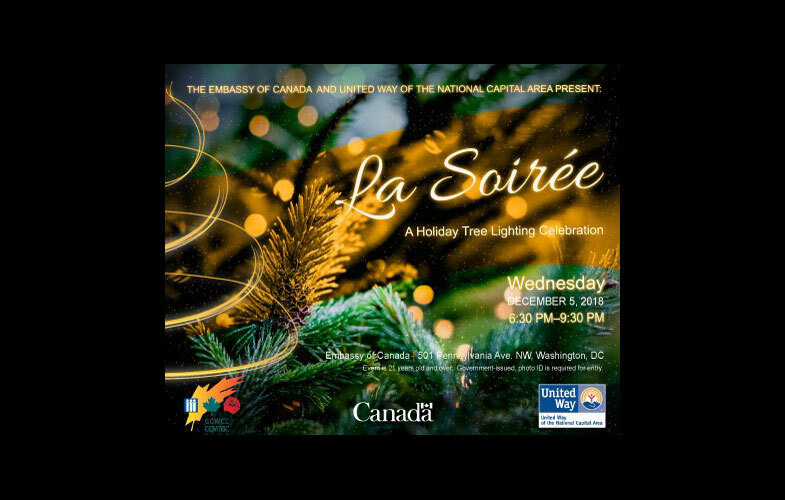 For United Way of the National Capital Area and the Embassy of Canada, the holiday tree represents an everlasting commitment to overseeing our communities grow stronger. Trekking the backroads of Annapolis Valley, Nova Scotia lying between two mountain ranges, through the rocky Appalachia covering the northeast corridor of the United States and down along the coast, the Balsam Fir featured in this year’s annual La Soirée in some ways embodies the journey that many in the national capital area take to a better, more sustainable life. Every investment in our community is a journey towards growth. Every seed that is planted is a promise for a better life. United Way NCA fights for the health, education and financial stability of every person in our community. It’s by establishing strong roots in each of these three pillars that we help the communities that have been left behind bloom above the surface. It’s in our investment in the answers to long-term problems that we help those in our communities each and every day. The contributions raised from La Soirée will go towards helping United Way NCA continue its journey to improving the lives of those in the national capital area who need it most. By choosing to attend La Soirée or donating today, you join us on the frontlines in ensuring that every student receives an equal education, every family has access to food, and every individual has the means to build a financially sustainable life. Join the journey to LIVE UNITED! Purchase tickets to join the journey. Can’t attend? Help United Way NCA continue the journey by donating today.